25 June 2015, Addis Ababa: Today, the Government of Ethiopia reiterated its commitment to put an end to child marriage and Female Genital Mutilation/Cutting (FGM/C) at the National Girl Summit held for the first time in its capital. 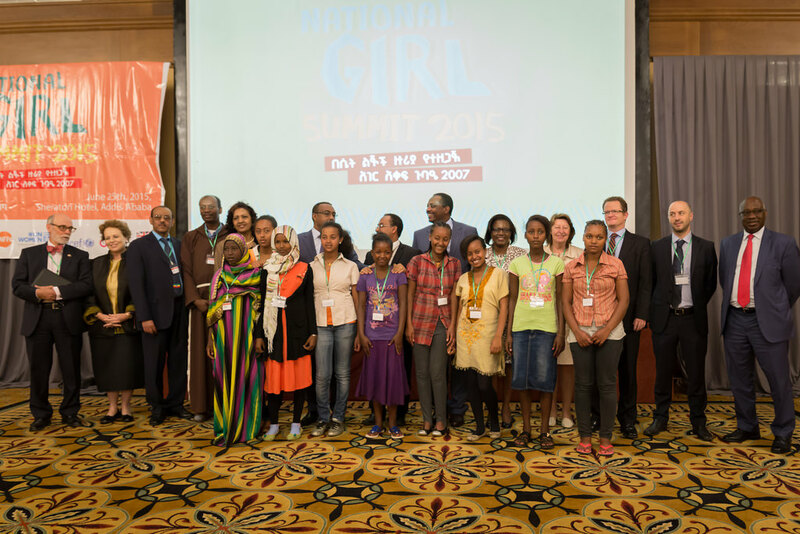 The Summit was held as a follow up to the Girl Summit in London held in July 2014 where the Government of Ethiopia took a heroic step by making a ground breaking commitment to end child, early and forced marriage and FGM/C in the country by 2025. The historic National Summit in Ethiopia was officially opened by H.E. Ato Demeke Mekonnen, Deputy Prime Minister in the presence of H.E W/ro Zenebu Tadesse, Minister of Women Children and Youth Affairs with over two hundred partners drawn from Sector Ministries of Justice, Health, Education and Finance and Economic Development, UN representatives, representatives of religious council, development partners, civil societies, the private sector, members of the media and nine adolescent girls as guests of honour. The Government of Ethiopia has formulated policies and legal and strategic frameworks to establish an environment whereby all citizens, regardless of gender, should have the right to determine his or her own future. However, harmful traditional practices (HTPs) such as child marriage and female genital mutilation/cutting (FGM/C) are still commonly practiced in the country, due to deeply entrenched traditional norms and values that degrades the lives of girls and women. According to the Demographic Health Survey (DHS), the national prevalence of child marriage declined from 33.1 per cent in 1997 to 21.4 per cent in 2009/10 and among children aged 0-15 declined to 8 percent in 2011.As to FGM/C, the national prevalence rate was 74 per cent in 2005, 56 per cent in 2008 and 46 per cent in 2010. Among children aged 0-14 years, 52 per cent in 2000, 37.7 per cent in 2010 and 23 per cent in 2011 which shows a consistent decline. Minister Zenebu on her part said that the Ministry of Women Children and Youth Affairs will continue to work closely and jointly with its sector Ministries and partners to support all the efforts on the ground including community conversations and also reinforcing the laws associated with harmful traditional practices. At the Summit, adolescent girls’ messages were geared towards the need for more support from religious leaders and law enforcement bodies; more schools for more girls to be educated; education on reproductive health; and above all the support from boys and young men to change their attitude towards harmful traditional practices. The Ministry of Women, Children and Youth Affairs established a national HTP Platform in order to realise the multi-sectoral mechanisms and to ensure effective coordination and collaboration between and among different development partners involved in the fight against HTPs. This National Implementation and Monitoring Platform will be established from representatives drawn from relevant stakeholders (Government line ministries, multilateral and bilateral donors, CSOs, women and youth associations and national federations, faith based organisations, and national associations) working towards the prevention and elimination of HTPs. Finally, the event was made colourful through the viewing of a rap song entitled, “Yalemachin Get” by young rap star- Abelone Melesse, UNICEF Ethiopia National Ambassador. The song sends a powerful message on children’s rights and making the world a better place for girls by educating, protecting and not turning our back on them as they need all our support. Moreover, an exhibition was part of the summit where local and international NGOs, CSOs and the UN working on the themes of child marriage and FGM/C showcased their work through print and electronic media.